Good forest governance has a central role in achieving sustainable forest management. It is also critical to ensure the effectiveness of plans to reduce greenhouse gas emissions from deforestation and forest degradation in developing countries (REDD), as well as to ensure the effectiveness of efforts to reduce illegal activities in the forest sector. Assessment and monitoring of governance are essential tools in promoting reforms to achieve better forest governance. Making available a compendium of evidence-based approaches to forest governance data collection could help countries decide between different options as they respond to various requirements, for example, such as those arising from the Voluntary Partnership Agreement (a bilateral trade agreement between the EU and some timber-producing countries) or from REDD+. PROFOR has developed a common framework for assessing and monitoring forest governance, in collaboration with the Food and Agriculture Organization of the United Nations and other partners, including the World Resources Institute, Chatham House, the European Forest Institute, and the UN-REDD Programme. PROFOR also piloted an approach for collecting data, based on questionnaires scored by multiple stakeholders, which so far has been used in a range of countries: Uganda, Burkina Faso, Kenya, Russian Federation, Madagascar, Democratic Republic of Congo and Liberia. However, this approach is only one of many indicator and data collection options available to practitioners. To improve the process, PROFOR has a new project that aims to compile a compendium of approaches to forest governance data collection, to provide practitioners with a menu of options that is customizable to specific contexts. The guide on data collection approaches will be accompanied by a library of forest data collection initiatives that have been field-tested in one or more countries. To the extent possible, the guide and library will be updated as additional field experiences become available. The production of this menu of options is expected to strengthen collaboration and cooperation between the World Bank and its partners in the area of forest governance diagnostics, to foster agreement on common indicators for forest governance, and to reduce multiple reporting. In June 2012, in Rome, thirty-five international and national experts gathered to discuss common issues in governance assessment and monitoring, and considered the value of producing resource materials for people measuring forest governance. The meeting resulted in the need for developing guidance for forest governance data collection and the creation of the Core Expert Group on Forest Data Collection. In November 2012, the first core group meeting took place in Brussels and produced an outline of the guidance—“a practical guide to measuring forest governance for assessments and monitoring”—and a plan for collecting tools and cases in this area. In June 2013, PROFOR, FAO, the UN-REDD Programme, WRI and others convened a second core group meeting. This meeting reviewed a draft guide based on the outline and discussed next steps. The guide was launched in June 2014, at COFO 22, in Rome. 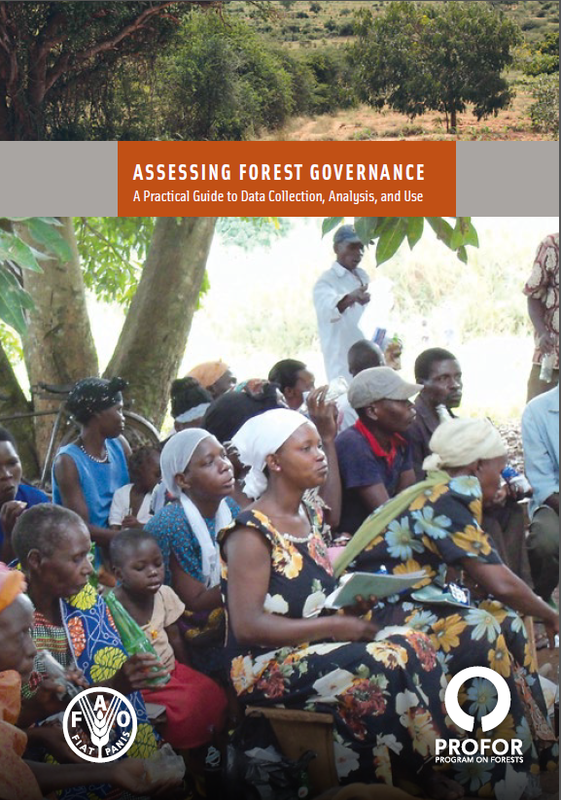 This guide presents a step-by-step approach to planning forest governance assessment or monitoring, collecting data, analyzing it, and making the results available to decision makers and other stakeholders. It also presents five case studies to illustrate how assessment or monitoring initiatives have applied the steps in practice, and it includes references and links to dozens of sources of further information.